4-star-hotel in the 2nd district of Budapest. The hotel has 289 rooms. 4-star hotel with a unique architectural style and panorama, located on the Buda side, within 15 minutes reach of the city centre. Services: 280 air-conditioned rooms and 9 apartments, conference and meeting facilities (10-250 persons), restaurant, coffee shop, large parking place. Budapest Restaurant with international and Hungarian cuisine - evenings evergreen music. Exclusive Miniature Restaurant, Coffee Shop with Salad Bar, Drink Bar, Summer Terrace. Room service, parking lot for cars and buses at extra charge, safe, gift shop, news-stand, telephone, telex, fax, cable, photocopying, typewriters, conference and banqueting facilities, sauna, fitness room. 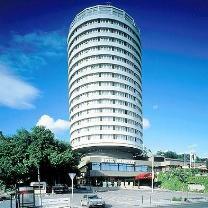 Hotel Budapest is the only cylindrical hotel in Hungary. There is a magnificent view of the city and the surrounding hills from the rooms, especially from the suites on the top floor. The hotel is ideal for conferences, corporate meetings, seminars or other special events. The Comprehensive Courtesy of Choice program runs in the hotel. During summer breakfast is served on the restaurant"s terrace, evenings grill parties are organized. Tennis courts are within 3 minutes, bicycle routes are winding in front of the hotel. AIR CONDITIONING IN EVERY ROOM!.